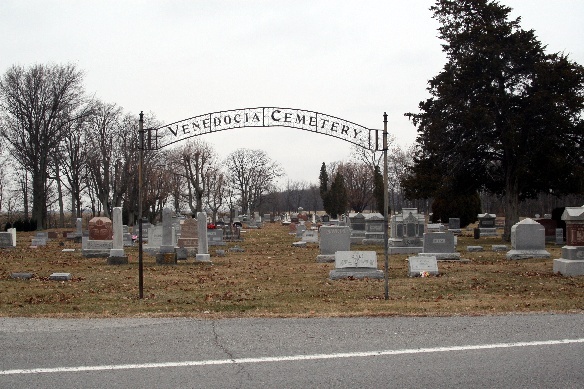 The following information up to 1987 is taken from the book "Van Wert County Ohio Cemetery inscriptions" publised in 1990 by the Van Wert County Chapter of the Ohio Genealogical Society. Data in the book was originally obtained in 1982 and partially updated in June 1988. Data since 1987 will soon be added based on walking through the Cemetery. The book is available in the Brumback Library. Additional inscriptions dating from 1988 through March 1998 are at the end of this list. Each bullet in the following list represents a separate stone. Abbreviations used on the stones include: d=died or days; w/o=wife of; s/o=son of; m=months; y=years; d/o=daughter of. · Foster, Serena A. d 10 Nov 1876 1y 10m 28d d/o G. & H.A. · Clending, Nancy d 25 Sept 1873 15y 25d d/o J. & N.
· Clending, Nancy d 19 Jan 1879 73y 1m 19d. · Bebb, Margaret d 3 Jun 1876 23y 10d w/o Wm. · Bebb, Inf s/o T.M. & J. · Jones, Elizabeth Alban d 6 Nov 1899 45y 4d w/o Wm. B. · Jones, Thomas Oscar d 2 Jan 1883 3y 4m s/o Wm. B. & E.A. · Evans, David W. 1837-1913, Jane Bebb d 10 Feb 1887 44y 10m 16d w/o David W., Thomas Charles d 17 jun 1890 22y 4m 14d s/o D.W.
· Evans, Jane d 25 Mar 1862 13y 7m 17d d/o R.E. & M.
· Price, Isaac d 9 Jun 1853 24y 2m 20d s/o J. & M.
· Price, _____ d 14 Sept 1854 41y 2m 28d s./o J & M.
· Smith, Rosie Alzina d/o J. & M.
· Smith, Clarrissa Rebecca d/o J. & M.
· Thomas, Sarah E d 13 Apr 1903 24y 3m 10d d/o J.T. & M., Jennett d 28 Sept 1865 3y 7m 25d d/o J.T. & M.
· Reese, Samuel d 26 Oct 1857 6y s/o J. & M.D. · Owens, Thomas d 10 Apr 1855 3m s/o R. & H.
· Hamilton, John R. d 5 mar 1872 11y 9m 7d s/o J. & M., James d 19 Sept 1869 67y 6m 3d, Amanda M. d 24 Jun 1866 16y d/o J. & M.
· Morris, Elizabeth d 5 Feb 1867 32y w/o John E.
· Morris, Mary Jane d 17 Aug 1893 27y 5m 10d d/o J.E. & W.
· Owens, Mary J. d 4 May 1873 25y 7m 20d w/o David J. · Jones, Margaret d 31 may 1867 51y w/o David J. · Barber, Catherine E. d 8 May 1853 46y 11m 20d w/o Wm B. · Jones, Elizabeth & David c/o E. & J., Ivor s/o E. & J., Mary J. d/o E. & J. · Evans, Jane d 12 Feb 1884 63y w/o Rowland Native of Wales, John d 11 Apr 1871 19y 4m s/o R. & J., Robert d 31 Jul 1856 1y 9m s/o R. & J. 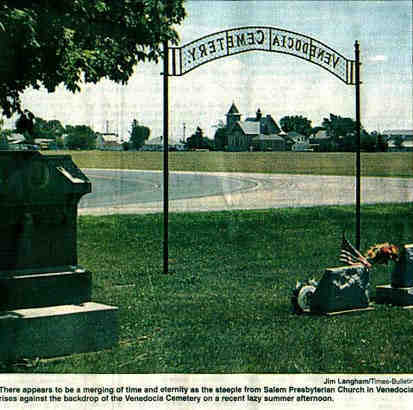 · Breese, Mary d 21 mar 1869 22y w/o John W., Andrew d 24 Feb 1864 2y 3m 6d s/o J.W. & M.A. · Miller, Willie d 23 Apr 1889 11y 10m 14d s/o J.J. & N.S. · Parry, leah T, d 18 Aug 1855 3y 5m 3d d/o T. & E.
· Van Eman, Olena d 11 Aug 1819 2y 1m s/o J. & A.E. · Griffith, Robert 28 Feb 1819 s/o N. & M.
· Davies, Mary Jane d/o D. & S.
· Davies, Sophia d/o D. & S.
· Thompson, T. (Thomas I.) 28 Oct 1826-25 Apr 1905 (Pvt Co A 99 Reg OVI Civil War), Catherine 10 Aug 1828-23 Jan 1899 w/o T.
· Jones, Cora d 15 Sept 1884 10m 28d d/o T.M. & M.
· Jones, Thomas A. M>D> d 2 May 1886 32y 2d, Mary Jane 13 jan 1856-4 nov 1945 w/o Thomas A. · Williams, Anna jane d 9 Jan 1936 w/o Thomas A. · Jones, Ella 23 Apr 1863-26 Dec 1882 borne at Oak Hill Jackson Co d/o B.E. & M.
· Jones, Mary E. d 1 Sept 1875 1y 6d d/o E.T. & J. · Jones, Edward O. d 25 Feb 1890 5m 6d s/o E.T. & J. · Kohn, infant d 21 Feb 1909 s/o O.J. & M.T. · Morgan, Abishac d 21 Jul 1889 56y 3m 28d w/o Rev J.P.
· Alban Rachel d 8 May 1910 82y 3m w/o Thomas A. · Evans, Elizabeth d 17 Apr 1891 44y 8m 21d w/o J.W. · Evans, Irvin Blaine d 1 jan 1887 2y 3m 13d s/o J.W. & Elizabeth E.
· Evans, Jennie d 14 Nov 1886 16y 2m 8d d/o J.W. & Elizabeth E.
· Evans, William d 19 Jun 1872 8d s/o J.W. 7 Elizabeth E.
· Baxter, John S. (24 Jun 1844)-15 Sept 1917 73y 2m 22d (Cpl Co A 52 Reg OVI Civil War) father, Ellen d 11 Jan 1901 54y 8m 17d mother w/o J.S., Arthur W. d 23 may 1901 31y 7m 11d s/o J.S. & E., Nellie d 22 Jul 1871 5y 1m 11d d/o J.S. & E.
· Morris, Lizzie d 10 Aug 1881 7y 9m 4d d/o O. & M.
· Roberts, inf of D.A. & M.J.
· Jones, John R. d 28 may 1871 22y 1m 13d s/o Abrahm & Margaret, Benjamin d 16 May 1873 3y 11m 9d s/o A. & M.
· Jones, Mary A. d 8 Sept 1876 37y 8m 18d w/o J.M. · Jones, Abrahm 15 Jun 1818-28 Oct 1905 87y 4m 13d father, Margaret d 23 Jul 1899 78y w/o A. · Williams, Evan E. (10 Feb 1846)-10 Apr 1882 36y 2m (Pvt Co C 179 Reg OVI Civil War), Elizabeth d 14 Oct 1879 38y 8m w/o Evan E., Morgan E. 25 Apr 1872-21 Jul 1897 s/o Evan E. & Elizabeth E.
· Owens, Richard m. 12 Oct 1820-19 Dec 1880 Montgomeryshire N. Wales 60y 7d, Mary d 8 Apr 1888 66y 3m 26d w/o R.M. · Jones David J. d 12 Nov 1927 77y 7m 25d, Elizabeth d 7 Apr 1902 48y 26d w/o D.J., Mary E. d 2 Jul 1888 3y 10m 27d d/o D.J. & E.
· Reese, Thomas J. 1832-1909, Elizabeth Proid. Thomas J. Reese Bu Farw Hydref 22-1891 YN 60 Mlwydo A 10 Misa 19 Dwrnod Oaed Genedical O Ordal Llanbrynmar Sir Drefaldwn C.C. · Williams, Emma L. d 19 Oct 1890 17y 11m 2d d/o W.E. & C.
· Williams, Catherine d 30 jan 1913 73y 9m 23d w/o W.E. · Williams, Mabel M. 1 Jun 1896-11 Sept 1896 d/o D.W. & D.A. · Hughes, inf s/o B. & A. · hughes, Edna Viola d 16 Sept 1900 15m 20d d/o Mr. & Mrs R.T.
· Owens, Edward G. d 25 Aug 1892 9m 12d s/o D.R. & S.A.
· Morris, Edward Gordon d 7 Mar 1900 2y 3m 12d s/o J.C. & M.A. · Morris, Mable E. 10 Nov 1891-27 Feb 1893 d/o J.C. & M.
· Evans, David J. d 21 Sept 1889 3y 5m 23d s/o J.L. & J. · Rees, David W. 1861-1925 father, Sarah J. 1858-1925 mother, Mary Jane 1860-1925, John H. 1853-1933, Margaret J. 1855-1891, inf s/o J. H. & M.J.
· Williams, John W. d 12 Mar 1883 1m 26d s/o E.B. & M.
· Davis, inf/o J.H. & M.E. · Price, John A. d 28 May 1899 ly s/o P. & A., William H. d 6 Aug 1900 1y 11m 9d s/o P. & A. · Breese, Alice d 1 Apr 1904 15d d/o J.R. & J.N. · Evans, Robert C. 1924-___,Jane B. (Breese) 1924-___,children Charlene L Connie L.
· Williams, William R. d 2 Aug 1900 39y 6m, Susan d 23 Jan 1926 66y 10m, Oscar N. d 7 Oct 1890 10m 12d s/o W.R. & S.
· Jones, Edward D. d 18 Feb 1901 1y 5m 23d s/o D.O. & E.A., inf d 24 jul 1898 s/o D.O. & E.A. · Shafer, Elizabeth Ann 9 Aug 1874-1 Oct 1912 w/o H.P. · Shafer,, inf s/o H.P. & E.A. · Shafer M. Bernice 1905-1907 d/o H.P. & E.A. · Jones, d 24 Apr 1903 inf s/o H.R. & J.R.
· Jones, Catherine Edith 28 Nov 1883-6Dec 1911 w/o Benj. G.
· Shaffer, inf d 10 Sept 1910 3y 8m 16d s/o C.M. & M.E. · Jones, Ethel M. 1904-1906, William Hayden 1907, Raymond 1909 children of W.H. & M.A. · Knipe, Jennie V. d 15 Jan 1896 29y 2m 4d w/o J.L., Jennie V. 12 Sept 1896 7m 28d d/o J.L. & J.V. · Jones, John Gilbert 1917-1919, Dorothy Jane 1923-1926 children of T.M. & T.L. · Uhl, Gilbert C. 1 Sept 1906 2m 9d s/o E.J. & D.M. · Hughes, Mary Ann 1862-1908 w/o D.T. · Davis, Thomas J. d 21 Jul 1887 61y husband of Harriet J. SOUTH SIDE the beginning of the readings for all the new sections south of the bridge. · Davies, Marcille inf d/o E. & G.
· Reese, Margaret j. 1879-1916 w/o Edward T.
· McMasters, Vallie V. (Monroe) 1899-1920 w/o P.
· Rhoades, Thelma 1918-1919 d/o A. & A.M.
· Beerman, Sharon Kay 3 Oct 1947 d/o R.W & M.E. · Davis, Mary E. 15 Nov 1930-22 Jun 1982 R.N.B.S.N. · Jones, Michael A 31 mar-1 Apr 1952 s/o B.J. & W.E. · Bebb. This marker in the old part of the Cemetery, is very difficult to read. It lists Wm. Bebb and his wife Margaret Bebb, one of the founding families of Venedocia. Daughters Martha Bebb (3 May 1858 - 20 Feb 1858) and Margaret Bebb Watkins (12 Mar 1837 - 9 Sep 1866) are buried with them. · Poling, Brian J. Nov 10, 1970-May 28, 1988. Son Brother Friend, If our love could have saved him he would not have died. So step softly, a dream lies buried here. Dathla'm Llawen. · Hundley, John W. Nov 9, 1919-june 8, 1994. Eva Nov 22, 1924-_____. · Van Eman, David I Feb 26, 1917-Aug 16, 1991. M. Jane Sept 16, 1919-____. · Davis, Walter H. Jan 23, 1918-Nov 3, 1992, cpl US Army World War II purple heart. Jessie L. Oct 2, 1930. · Davis, Johnny Lyle dec 27, 1957-Apr 15, 1995. Father of Johnny Lyle Jr, Brandon J, Chase C.
· Jones, James Elliott May 1, 1917-Feb 24, 1993. Grace Erma Mar 8 1917-_____. · Rees, Evan Clarence July 27,1920-May 21, 1996, Sgt. US Army World War II. Helen Frances 1920-___. · Jones. Married may 29, 1920 Anna D. June 13, 1887-Mar 17, 1985. Walter O. June 6, 1886-Apr 7, 1995. · Williams, Edward W. 1893-1977. Mary Alma 1894-1988. · Evans, Daniel J. 1899-1965. Ruth E. 1901-1995. · Jones, R. Paul Aug 8, 1909-may 3, 1993. Latalia E. Sept 1, 1913-____. · Game, William L. 1907-____. Hazel Lloyd 1904-1996. · Miller, Winnifred Lloyd 1898-1990. Hubert 1989-1953. · Richards, E. Howard 1901-1994. M. edith 1902-1984. · Long, Floyd E. 1940-1971. Gwen Sisson 1921-1989. · Brown, Thomas W. cpl US army world War II, May 11, 1910-Sept 28, 1996. · Monroe, Thomas A. 1915-1992. Lela L. 1918-1993. · Waltz, Kenneth Ira 1906-1989. Gladys Meredith 1906-1992. · Lewis, Anna L. 1900-1993. Wakter D. 1895-1973. · Zent, Walter Nov 30, 1907-Oct 24, 1995. Verna Lucille June 6, 1921-____. · Campbell, Fredrick 1905-1971. Bertha 1908-1989. Together forever. · Jones, Edith K. 1913-1995. David V. 1908-1972. · Hughes, Father William S. 1896-1970. mother Helen B. 1902-1997. · Evans, Richard M. 1890-1947. Alta A. 1892-1990. · Girod, Daryl L. "Doc" 1941-1992. Carolyn S. (Morgan) 1942-____. · George-Ruddock, Palmer M, 1988. Alice J 1997. Gloria, Jean, John B. · Owens, Mary Davies beloved wife and mother Mar 26, 1912-Jan 4, 1995. · Smith, Kelsey Rebecca. God's little angel Aug 10, 1994-Nov 22, 1995. · Davies, William E. 1909-1996. Elizabeth M. 1907-1983. Wed June 30, 1934. · Reese, Gomer R. Feb 6, 1906-Mar 12, 1996. · Taylor, Emma 1903-1930. Melvia 1908-1988. fred 1903-1964. · Davis, Lorraine 1918-1992. David P. 1911-1973. · Jones, Edward M. July 10, 1906-Aug 18, 1990. Florence E. Apr 12, 1904-June 24, 1997. Arlene Marie Jan 22-March 2 1942. · Reese, Morris J. July 23 1894-May 18 1983 veteran World War I 383rd infantry United States Army. Ann Louise Nov 28, 1900-Sept 13 1991. Pvt. William J. Dec 13 1932-Sept 11, 1954. Died while in the service of our country United States Army. · Williams, D. Luther 1905-1987. Starley E. 1908-1992. · Jones, Thomas Osborne 1895-1989 Minnie Weaver 1897-19___. · Schwartz, John H. Nov 28, 1929-Sept 1, 1990. Evelyn D. Sept 19, 1936-____. Married june 30 1957.